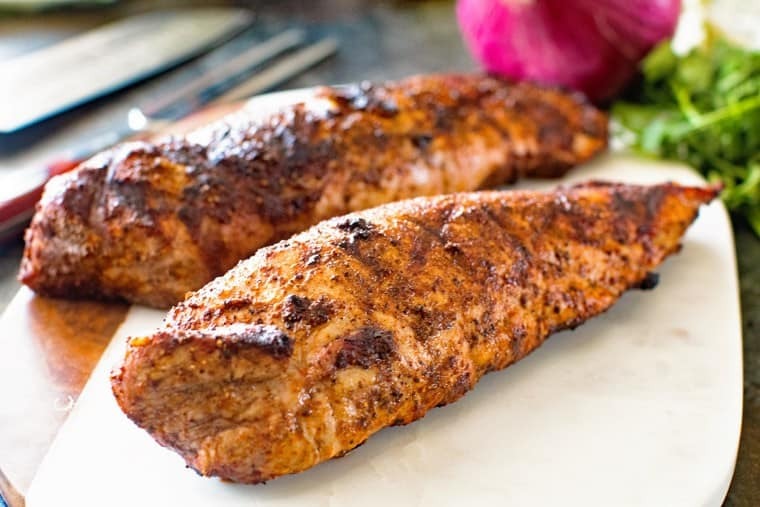 This tender, juicy grilled pork loin is seasoned with Taco seasoning and then grilled. The result is a delicious Southwest Pork Loin that has a bit of a kick! The perfect easy grilling recipe! Did I mention it’s only THREE ingredients? I will say that hands down pork loins are one of my favorite things to throw on the grill. 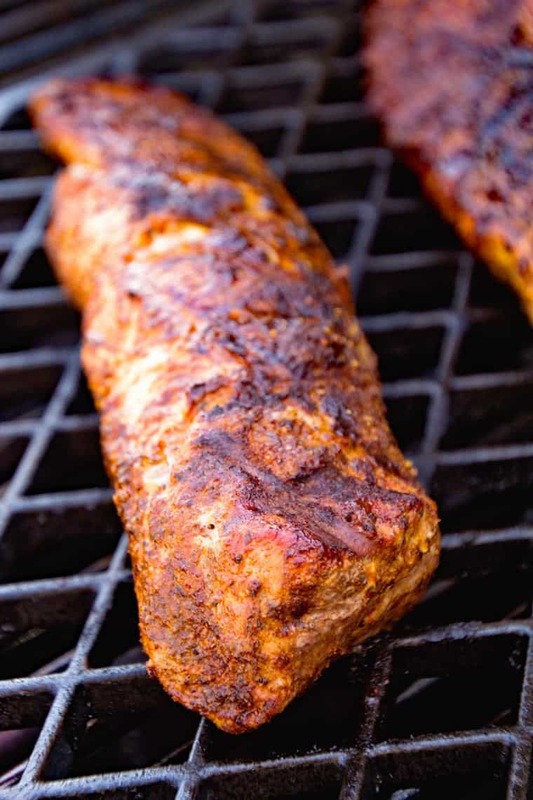 A quick seasoning and then 30 minutes on the grill gives me a juicy, tender pork loin. 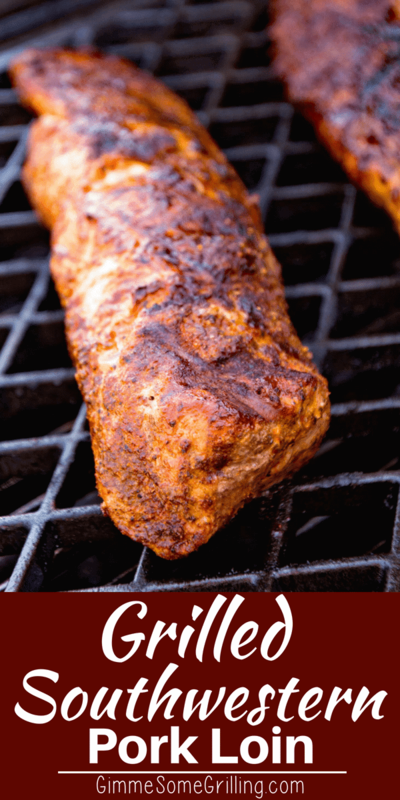 This quick and easy Southwest Pork Loin is only three ingredients and full of flavor! 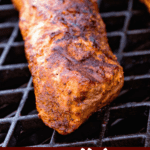 As much as I love to grill pork tenderloins my husband adores a great Smoked Pork Loin so we make that for parties a lot because it’s so easy! Plus, my kids love them too. Sometimes I feel like the only thing they want to eat is chicken. Does anyone else feel like that? Now, given the fact they often call pork, chicken instead, they eat it and I’m not going to correct them in fear of them deciding instantly they don’t like it! Sometimes you just roll with the punches, ya know? You know what else I love about grilling a pork tenderloin? It’s pretty much inherently healthy as with most grilled food. It’s so much easier to eat healthy when you are grilling! 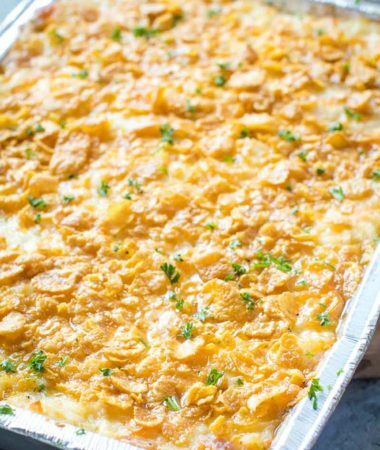 I love to throw my favorite baked potatoes on the grill along with some corn on the cob and I instantly have a meal that’s delicious, easy and healthy! Like, seriously, can summer last all year long? When I’m dreaming of summer nights and lazy days during the bitter months of the Minnesota winter you can bet that this Southwest Pork Loin will be high on that list! Soak up the summer and throw a Pork Loin on the grill tonight! Like I said before this is so EASY to make anyone can pull it off! It only has three ingredients. 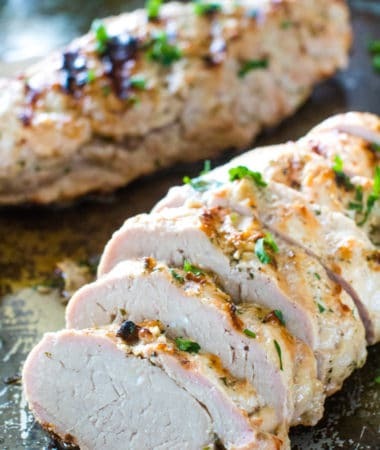 First place your pork tenderloins on a baking sheet or cutting board. Then give them a good rub all over with the olive oil. After that grab your taco seasoning and rub it all over the entire pork loin. Let it rest for 15 minutes. Preheat your grill to 350 degrees F at this time. 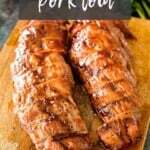 Place pork loins on grill and grill for 30 minutes or until the internal temperature reaches 145 degrees F.
Remove from grill, cover with foil for 15 minutes and then slice! Check out how easy it is to make with this video tutorial below! 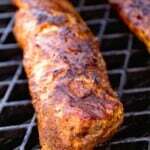 This tender, juicy grilled pork loin is seasoned with Taco seasoning and then grilled. 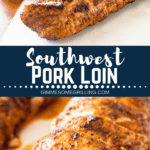 The result is a delicious Southwest Pork Loin that has a bit of a kick! The perfect easy grilling recipe! Place pork loin on a baking sheet or cutting board. Rub pork loin with olive oil and then season with taco seasoning make sure to cover the entire pork loin. Let pork loin rest for 15 minutes. Place pork on grill and grill for 30 minutes or until thermometer reaches 145 degrees F. Rotate tenderloin every 10 minutes. Remove from grill, cover with foil and let rest for 10 minutes before slicing. You can also baked these in the oven at 350 degrees F for about 30 minutes or until internal temperature reaches 145 degrees F.
Pork loin is one of my favorite cuts of meat. I always seem to do the same thing over and over with it. Excited to try this super easy recipe out! YUM! 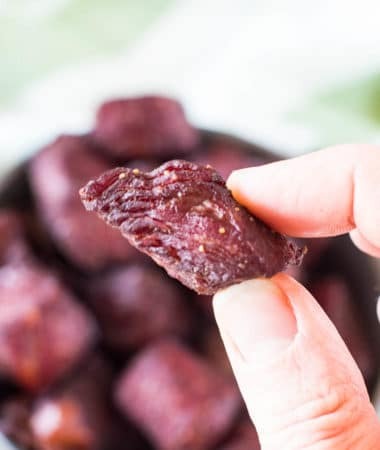 So easy and such great flavor to get out of a rut! 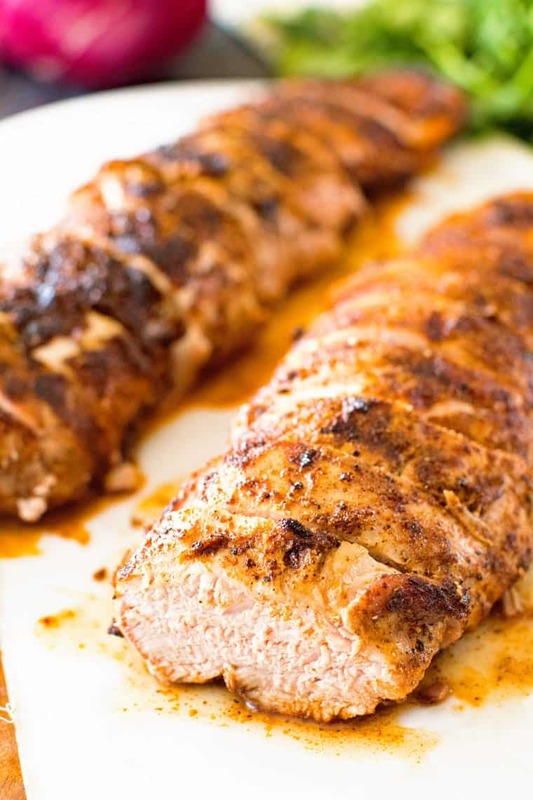 Your pork loin looks amazing! Perfectly impressed my friends. Thank you.